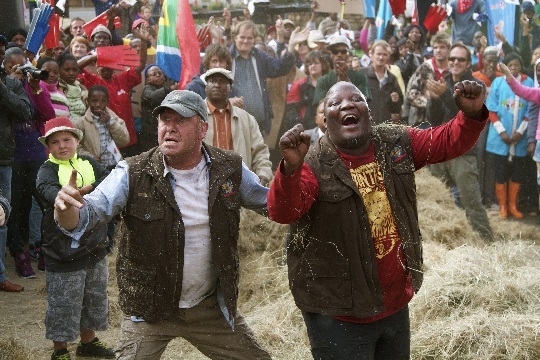 Mad Buddies is the latest offering from Leon Schuster and it is as madcap and slapstick as you would expect it to be, the tone immediately set as characters lose toes and are chased by wildlife. Boetie (Schuster) and Beast (Nkosi) cannot stand each other and their quarrelling lands them in jail with accusations of racism levelled against them. Upon their release they unwittingly become the focus of a reality TV show as they are tasked with walking to Gauteng from KZN (a good 600km) and told to get along or go back behind bars. The gags are entertaining for a while as the two try to antagonise one another, but they often become unmotivated and lose their effect and a lot of old jokes from previous films are rehashed. Schuster and Nkosi have great fun with their roles and have good chemistry; while Ntombela’s character, as the Minister of Tourism, is classic Schuster but almost pointless as he is really just there to add more sight gags. A lot of the other acting, meanwhile, is astoundingly atrocious and painful to watch. At times it turns into nothing more than a barrage of gags and with a running time of over two hours, it really starts dragging. My penchant for Schuster’s films has waned so I rolled my eyes at a lot of it, but admittedly there were times when I laughed out loud. There are some surprisingly sharp digs as well that are so subtlety delivered that they almost go unnoticed. By incorporating the theme of reality TV it expands on Schuster’s love of candid camera, thereby making it identifiable for an international audience too. It does, however, have moments that only South Africans – or perhaps a few shrewd foreigners – will catch. This is what I always loved about his films: that they were thoroughly South African and in many ways could only be appreciated by a South African audience and Mad Buddies does have that aspect which allowed me to enjoy it on a level beyond the silly jokes. Originally published on Fortress of Solitude.